Administrator can configure the settings and all the details regarding Time and Expense submission in AccountSight. Admin has the authority to define the projects and tasks for which Time and Expense sheets can be submitted. Also, Admin assigns people access to their corresponding projects and tasks for submitting Time and Expenses. 2] Click on Time & Expense. 3] Within Time & Expense, go to Customers sub tab. Click on Add new button to add new Customer. Click on Add Contact button to include Contacts for any particular Customers. 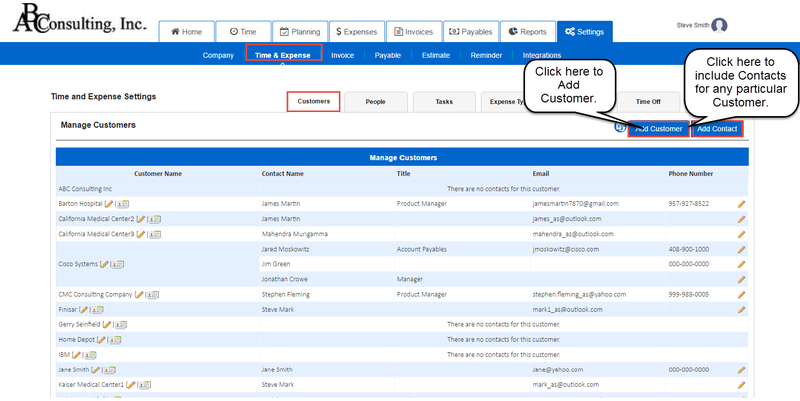 You can also Edit or Delete any Contact or Customer entry. 4] Within Time & Expense, go to People sub tab. Click on Add new button to add new People. Select the Person Type (Employee or Contractor) and choose the Permissions (Administrator or Regular User) as per requirement. Add other basic detail. Save the entry. 5] Within Time & Expense, go to Tasks sub tab to create a new Task. 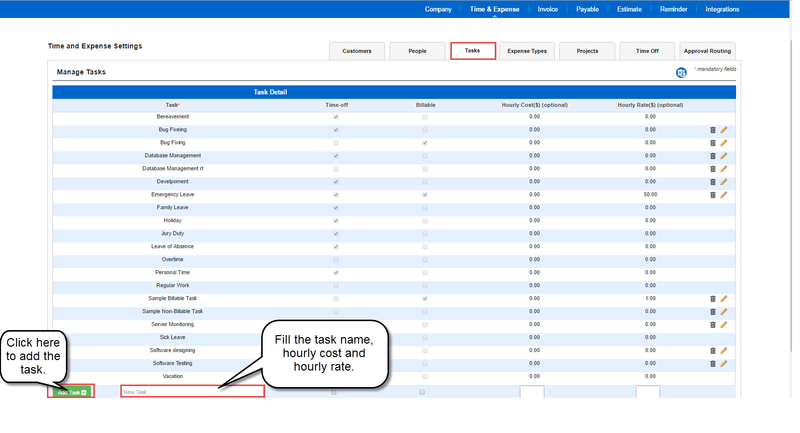 Enter the task name, billable option and hourly rate. Click on Add Task button. 6] Within Time & Expense, go to Expense Types sub tab to set the list of Expenses allowed to be billable. To create a new Expense, Enter the Expense Category, Optional Price per Unit and Unit Name. Click on Add Category button. You can also Edit or Delete an existing entry. 7] Within Time & Expense, go to Projects sub tab to create or edit Projects. Click on Add new button to create a new project. Fill up all the information fields correctly. 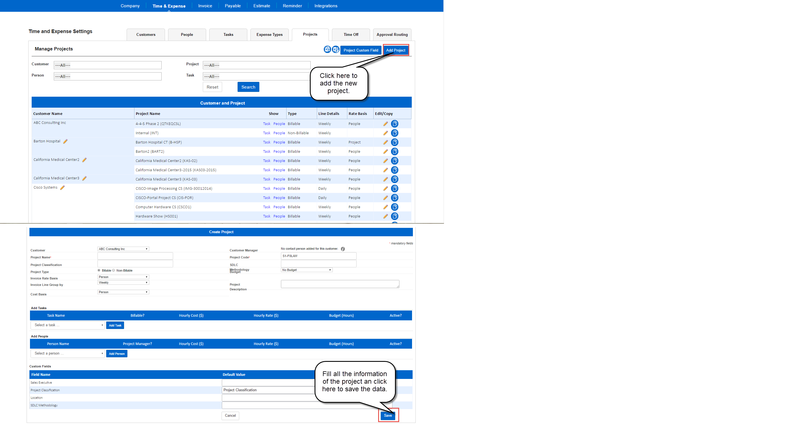 Use Add Task and Add Person options to add tasks and people respectively for the project. Tick the check box Manager to assign a person as manager who can have the authority to approve time and expense sheets for all other regular users in that particular project. Save the entries. After the setup is done, Admin can allocate resources and assign Project Managers to different projects.